Standard Levetator is suitable for tank up to 10' tall. Levetator's can be customized for tanks taller than 10' for a fee of $35 plus $0.50 for each additionl foot of tank height. The bright aluminum indicator with its red band can be seen from afar, more than 300 feet. Unlike homemade water level gauges that read back to front, the Levetator shows the actual water level. What you see is what you have. 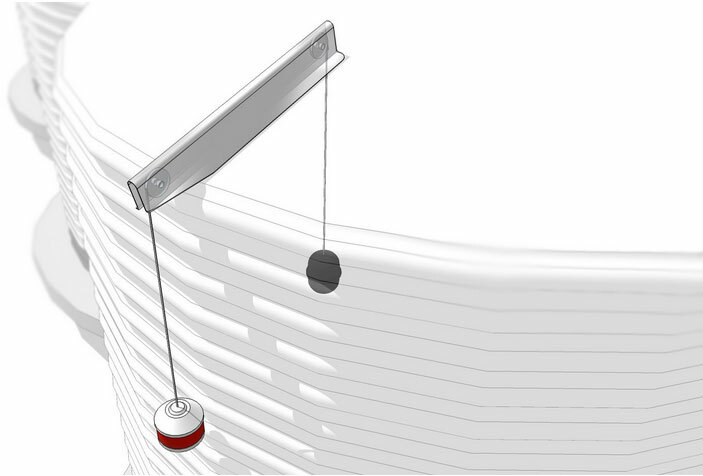 No gimmicks, no batteries, just a simple float/weight/pulley system. All necessary items (template, instructions and fixings) are provided to make it easy for the handyman to mount the Levetator on the tank roof. If your tank roof is taller than 10ft, please allow us to place a custom order for you. Year in, year out, the Levetator water level gauge provides reliable service thanks to quality materials and large, free-running pulleys. The weighted float and indicator are connected to the counterweight by separate cords, each cord running over a pair of pulleys. When the float is half-immersed everything is balanced. Rising liquid level lifts the float up, the counterweight moves down, and the indicator keeps pace with the float. Falling liquid levels causes the weighted float to pull the counterweight up, and again, the indicator keeps pace with the float. At all times the indicator matches the liquid level exactly. No. All gauges are mounted on the roof. There is no need to enter the tank. Yes, but being a relatively heavy aluminum die-casting, the indicator doesn’t move all that much, and in 99% of cases, there is no problem. If the site is particularly exposed to high winds, a wind guard made of 90mm slotted PVC stormwater pipe or a sheet metal channel is effective. Better still, use a Liquidator 2 Level Gauge instead – the indicator is captive on the pipe and unaffected by wind. No, the Levetator and Liquidator can all be mounted readily anywhere on the tank roof. Be aware that the level gauges fit tanks as tall as 10ft high. If you have a taller tank, please allow us to place a custom order for you. Very little. Yaktek gauges are built to last. We recommend that they are checked occasionally to make sure they move freely – it is possible that spider webs, mud wasp nests, dust build-up, etc., could restrict movement. Water can be used for cleaning, but never lubricate with oil – it will attract dust. Indefinitely, as long as the gauge is mounted properly so that the cord cannot touch or chafe on the tank roof. Some Levetators still have their original polyester cord after 15 or more years. Click the button below to add the Levetator Tank Level Gauge to your wish list.